Running 26.2 miles is no mean feat. On 22nd April 2018, barrister Ed Francis and paralegal Ginny Bicciolo did just that, taking on the challenge to run what turned out to be the hottest London Marathon on record, raising vital funds for the Bar Pro Bono Unit and access to justice. "It was not just an amazing day, but an exhilarating three months which will live large in my memory. The task of training for a 26.2 mile run seemed monumental but was made so much easier as donations kept coming in towards my fundraising target. And the run itself was the hardest thing I've ever done but the sense of achievement in getting to the finish line for the Unit made the pain irrelevant. I'm very honoured to have run for the Unit - an incomparable experience." 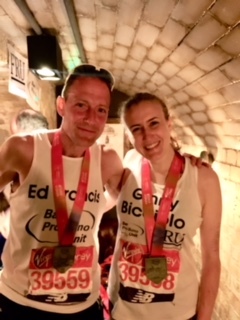 Ginny and Ed’s decision to run the marathon for the Bar Pro Bono Unit raised an incredible amount of money that will enable us to improve the efficiency of our service and offer even more people access to justice. We cannot thank our wonderful marathon runners enough for this amazing demonstration of their dedication to pro bono work, and we are delighted to offer our congratulations for this fantastic achievement! If you are keen to follow in their fast footsteps and want to run the marathon in support of the Unit next year, please email communications@barprobono.org.uk. Or if cycling is more your thing, why not sign up for The Legal Wheel Appeal, our exciting London to Paris bike ride this September?